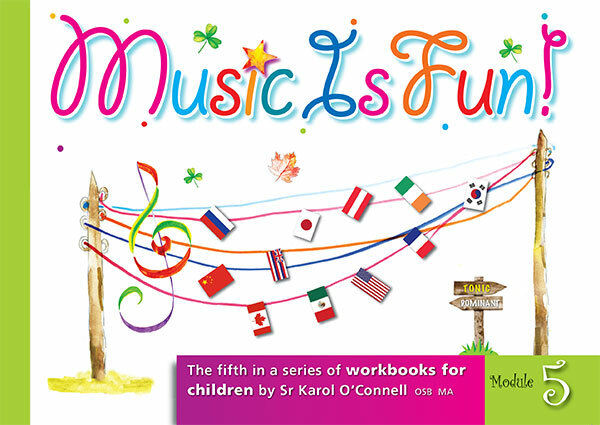 The fifth in a series of workbooks for children by Sr. Karol O’Connell. 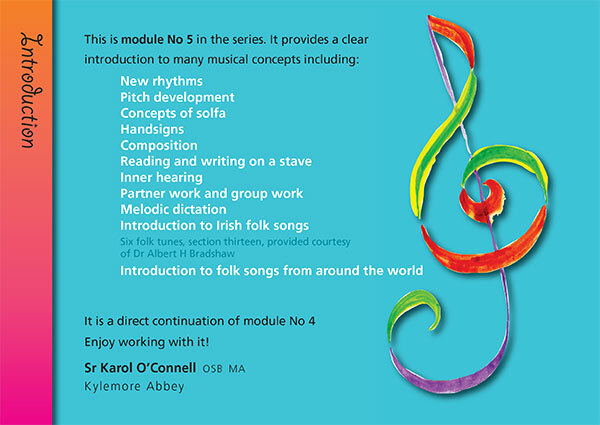 An introduction to new rhythms, pitch development, melody and composition, inner hearing, slight, singing, melodic dictation, Irish folk songs and folk songs from around the world. It is a direct continuation of module no. 4. 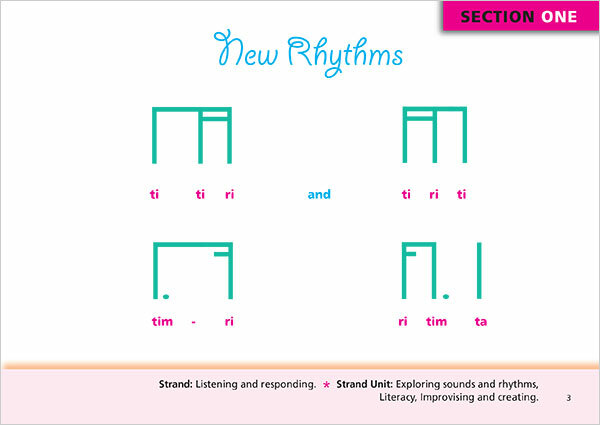 New rhythms are introduced. 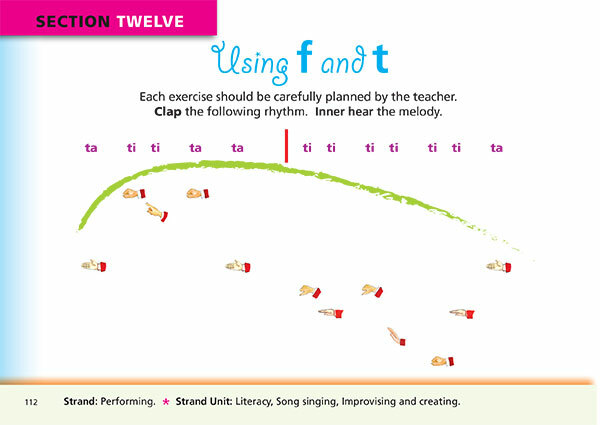 Several clapping exercises follow for the class to do together, later the child can do them alone. Half way through the chapter the exercises get more difficult and partner work is encouraged. Silent beats are included to sharpen rhythm awareness. 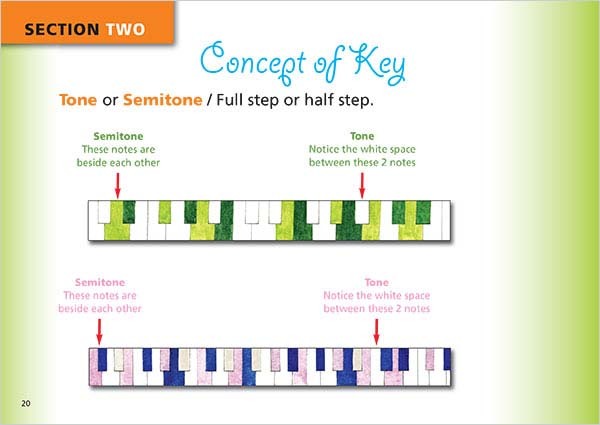 Tones and semitones are dealt with in this section. 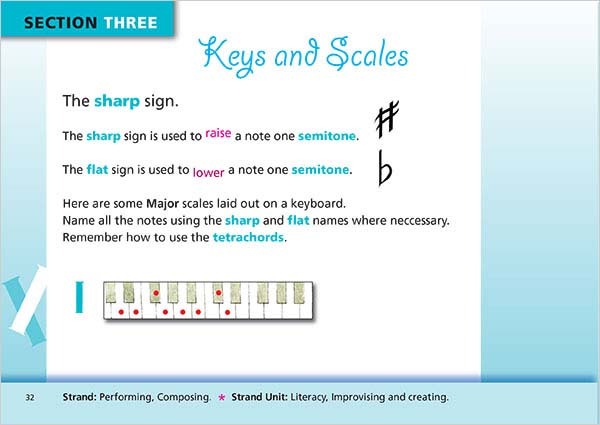 Keys and keyboard awareness is taught with many visible aids gently leading on to the next section about sharps and flats. The child, now able to cope with sharps and flats is ready to learn about absolute names of these sharpened and flattened notes while relating them to the keyboard. 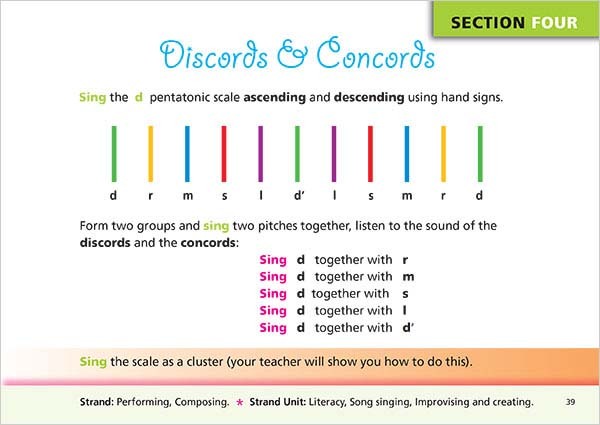 This section deals with discords and concords and is a section that will involve a lot of singing…..It is well worth spending time on these exercises, they will help intonation no end. 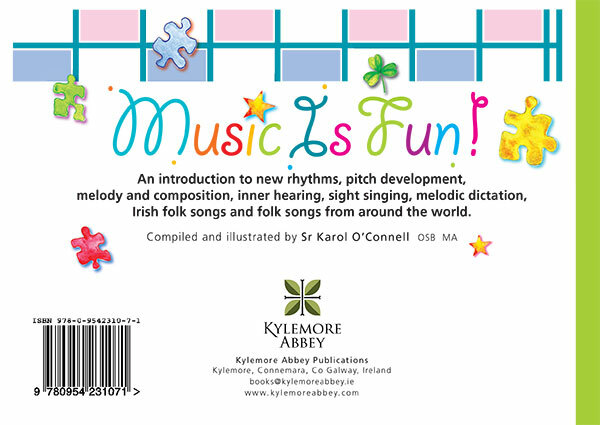 A lengthy section to encourage the child in rhythmic composition. 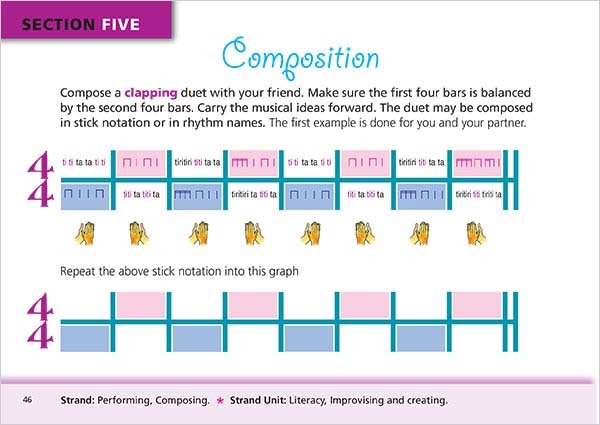 The child has to be familiar with both rhythm names and with stick notation. All of these exercises should be performed by each pair for the rest of the class. Use a mechanical pencil and write small. The exercise may be done in many different ways. Explore and have fun with these. 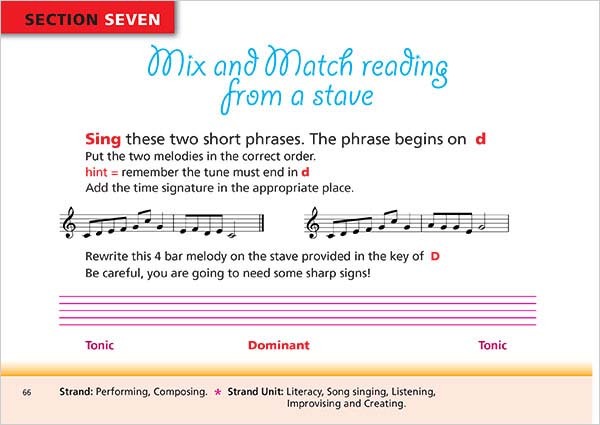 This section incorporates sight singing, rhythm writing and melody transcription on the stave.Each exercise is designed for partner work. The exercises can be used over and over again and can be mixed and matched in many different ways. Encourage the children to find as many ways as possible. This section is very like the previous section but a little more challenging. 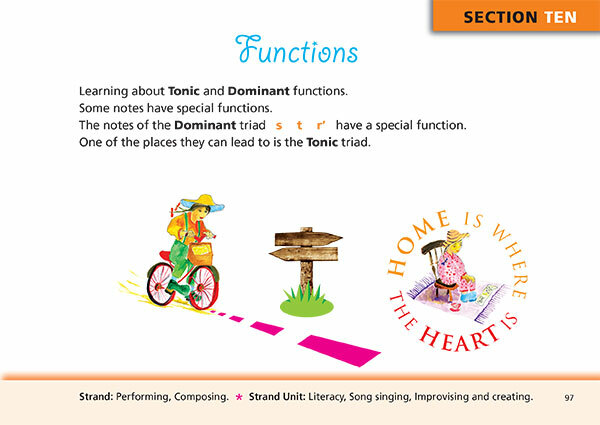 The awareness of Tonic and Dominant must be to the fore in all of these classes. 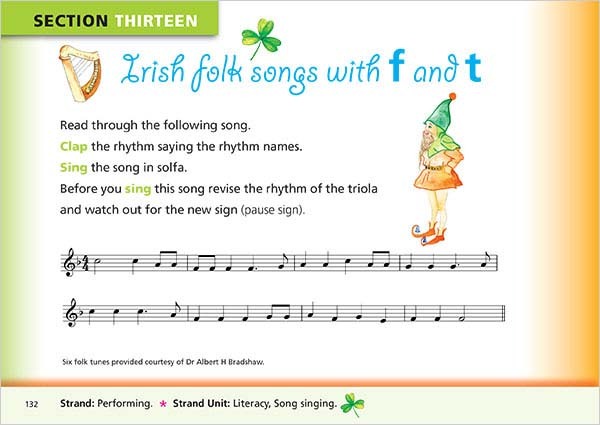 Remind the children again and again ‘sound before symbol’ Take time with each page and get the entire class to sing and re sing both phrases. 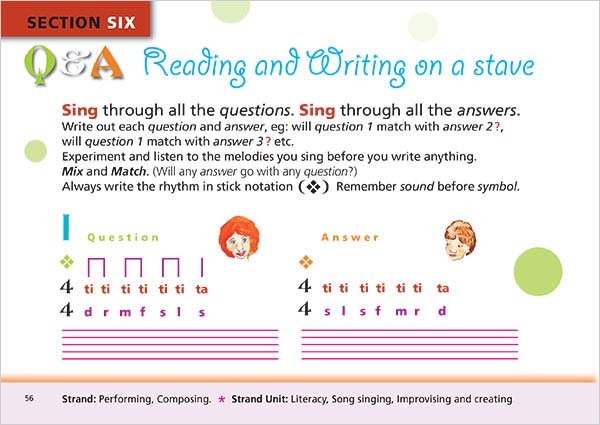 Don’t just do this at one class….sing the pages in the correct order many times. 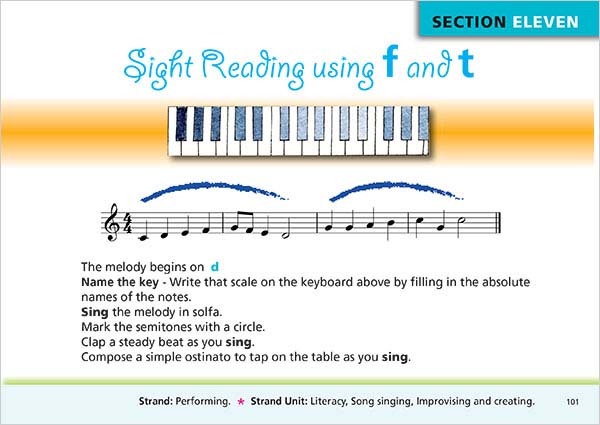 Again like the two previous sections this section expects the child to be able to sight sing with reasonable fluency. If this series of books has been followed from the start there is no reason why this would not happen. 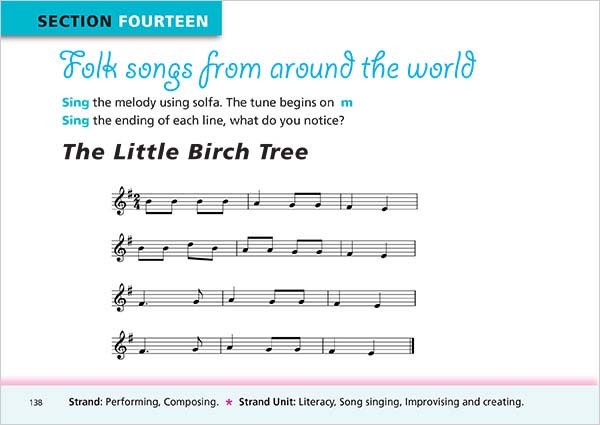 Make sure the class can sing theses one bar melodies from any given pitch, the pitch need not be the same while the class is working through a new page .Again , take lots of time going through these pages, no need to rush. The important thing is that the children are comfortable with the level of reading and the each child in the group never gets discouraged. 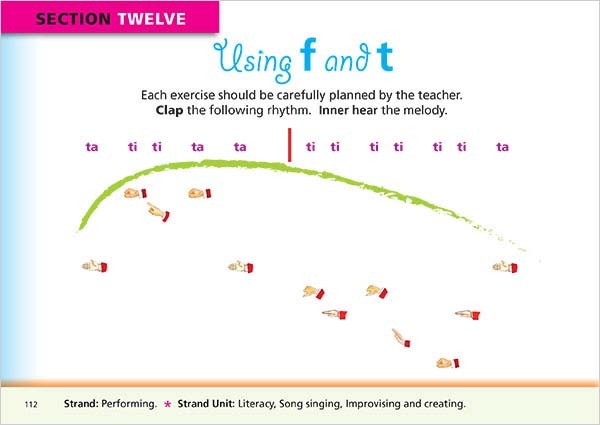 The best way to approach this section is by dividing the class into three groups and literally SINGING your way through it .The child learns how to write the chord grid. This should be encouraged in different keys. 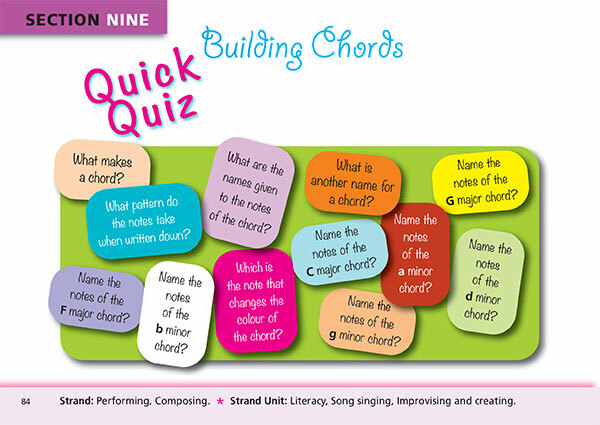 There are three different ideas given for teaching chords. It is a good idea to teach all three. Notice how written and aural skills are improving together! 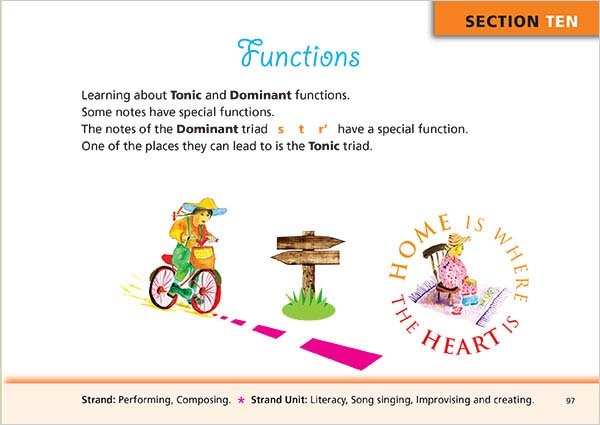 This is a very short, though important section introducing function in music. The musical phrase is also introduced for the first time. 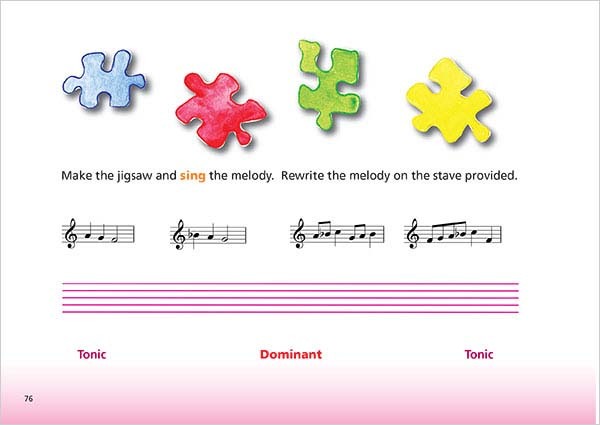 This is an important step forward in any child’s musical development and time should not be spared in developing musicality and in the shaping of musical phrases. 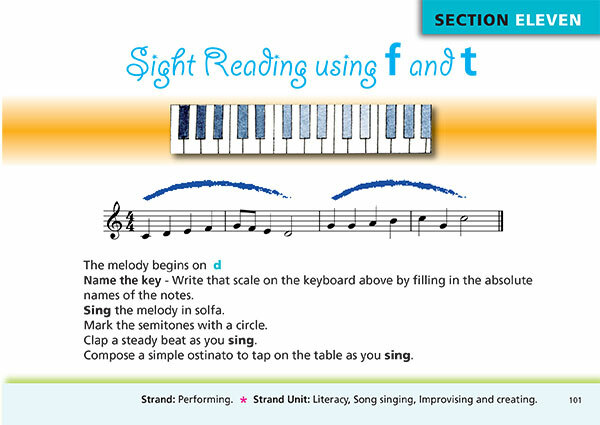 A section on sight reading using f and t .Notice a keyboard on each page, as the child sings the melody he/she points to the notes on the keyboard. This section is similar to Section 11 but in section 12 hand signs are once again used. 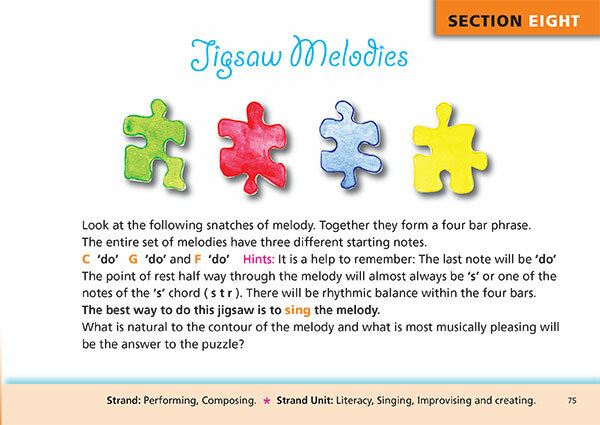 The second half of this section is given over to melodic composition. 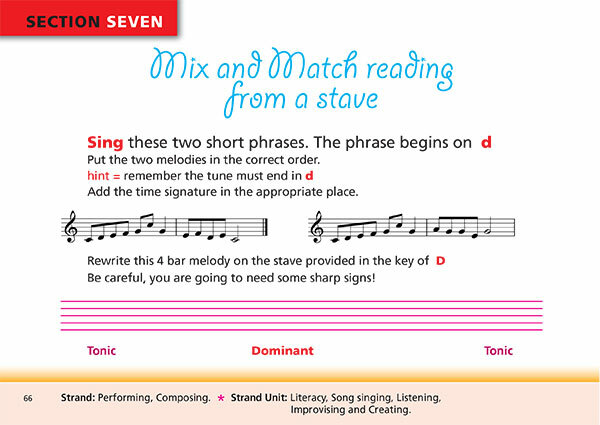 Almost game like, the melodies are shaded so that the child learns how to write a good four bar melody, darkest shade is written first etc. 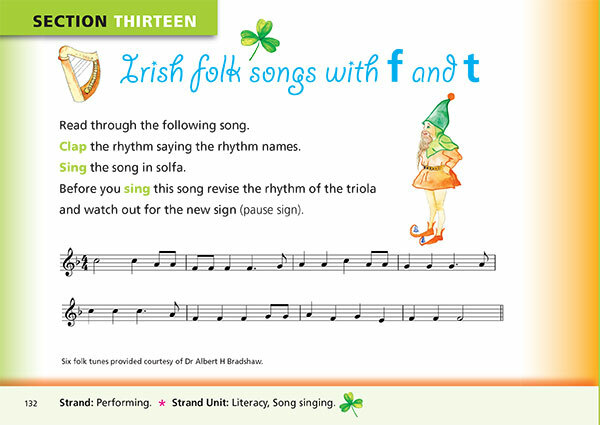 Six beautiful Irish folksongs to read and sing in solfa. Enjoy them!! 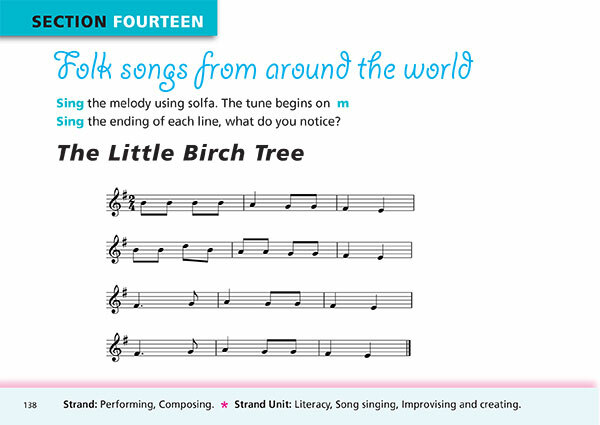 Folk songs from around the world. Have fun sight singing these beautiful songs. 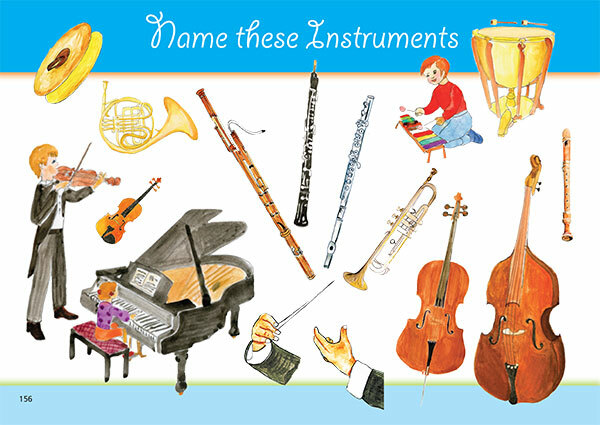 Three more instruments follow on page 153. On page 156 be sure to point out to the children the position of the conductor and of all the instruments, a modern symphony orchestra. Enjoy using this beautiful book.